This home's contemporary floor plan features an open living area and split bedrooms for homeowner privacy. The two story foyer is overlooked by the hallway on the second floor. The large dining/living room is expanded further by a cathedral ceiling, while skylights and numerous windows add natural light. The kitchen is generous and opens to the dining/living room via a handy breakfast bar. The master bedroom in this house plan is privately located on the first floor with two additional bedrooms upstairs, and every bedroom features a walk-in closet. 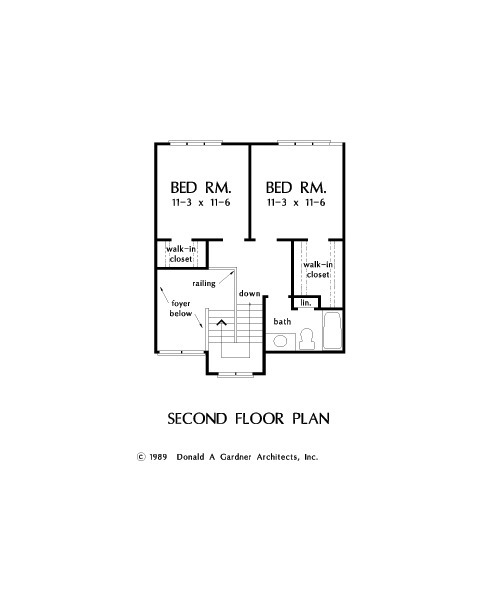 1st Floor: 1209 Sq. Ft.
2nd Floor: 525 Sq. Ft.
House Dimensions: 48' 6" x 49' 0"
Foyer (Vaulted): 6' 0" x 10' 0" x 17' 0"
Kitchen : 9' 6" x 15' 0" x 8' 0"
Utility Room : 9' 6" x 7' 4" x 8' 0"
Garage : 19' 4" x 20' 0" x 0' 0"
Garage Storage : 7' 4" x 4' 4" x 0' 0"
Master Bedroom : 13' 0" x 15' 0" x 8' 0"
Bedroom #1 : 11' 3" x 11' 6" x 8' 0"
Bedroom #2 : 11' 3" x 11' 6" x 8' 0"
Porch - Front : 6' 0" x 4' 8" x 0' 0"
Deck / Patio : 23' 6" x 13' 4" x 0' 0"
Living Room (Cathedral): 13' 2" x 25' 8" x 16' 0"